This is a post by PumpUp’s @toafitme. Follow her blog here. Hi PumpUp fam! 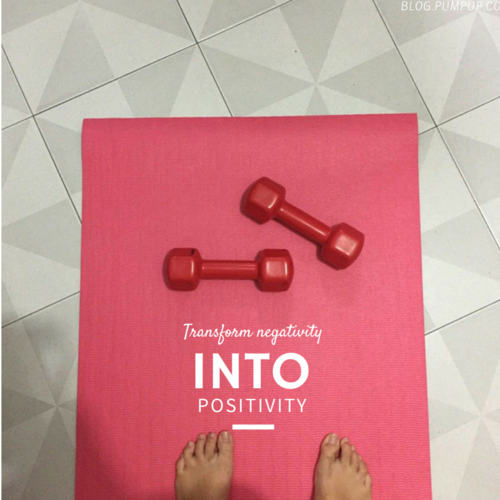 Since we are talking about being positive throughout the month of December (and the months thereafter), I’ll be sharing about the negative thoughts I had during my weight-loss and fitness journey and how I managed to overcome them. These three pointers will absolutely help you to transform negativity into positivity (and trust me, I speak from experience). When I first started my weight-loss journey, I used to be very insecure about my physical appearance. I was inundated with pictures of ‘hot’ and skinny girls on Instagram, on blogs, and on all other social media platforms, and this made me feel much worse. I would compare myself to them. I would constantly ask myself why I didn’t have a body like theirs. Sometimes, I was even so depressed that I skipped my meals. One day, I decided that instead of dreaming about the body that I always wanted to have, my time was much better spent focusing on my own fitness journey. Instead of comparing myself to others, I told myself that since they could do it, I could do it too. This motivates me even till now and I always remind myself about it. I can’t stress this enough: STOP COMPARING YOURSELF! Love your own body and start doing something about it instead! Want to kill those negative thoughts? Don’t give into them. Once these thoughts occur, do not stop what you are doing. Tell yourself that these are all excuses and you should not put a limit to yourself. I often found the phrase “mind over body” true, and it really does push myself to strive for my best potential. After all your hard work, you will definitely feel a great sense of accomplishment! The key here is to really believe in yourself and affirm that you can. You definitely can overcome these negative thoughts and push yourself for the best. Lastly, the most important element of any fitness or weight-loss journey is to be patient. We often tend to expect results after putting in minimal effort or we often give up after we see little or no results. During this journey, we need to learn to be patient. At certain times, I get upset by the fact that my weight increased instead of dropping; or that my abs were not as defined as the day before. It is crucial that we should not give up at this moment and we have to keep reminding ourselves that we should be patient. Health and fitness is not about a matter of time it takes to achieve a goal, but about the process or progress it takes to get us there. When we continue to believe in what we are doing and persevere, we will eventually achieve our goals. I hope that you all will find these tips useful and that you will become more positive during your fitness / weight-loss journey!